PROMISE KNIGHT (FORMERLY CAMPBELL) WHO IS THE INSPIRATION BEHIND THE FOUNDATION, ANSWERS QUESTIONS ABOUT HER LIFE AND EXPLAINS WHY THIS CHARITY IS SO IMPORTANT TO HER. The Promise I am today, the person who graduated top of her class from St Catherine’s College Cambridge despite entering below her peers; the person who single handedly forced open the mighty doors of Westminster – both the unspoken and unconscious barriers imposed by both Houses – is a product of sheer will and community effort. My secondary school, Queen’s Park Community School, became my safe haven. The staff became the voice of encouragement that I so desperately needed and desired. They reminded me of my position in the race of life – both of where I had begun, and where I could eventually finish. They were on the sidelines, encouraging me to stand up each time my esteem was knocked or thwarted. My story alone is not enough for a harvest, but I’m convinced that Promise Foundation will be. What sort of a child were you? I was a very inquisitive, curious and adventurous little girl. But not always a very happy one. Can you tell me a little about your background and home life? I was born in Nigeria and lived there until I was about 3 when I joined my mother in the UK. My mother had come to Britain to work and sent for us to join her and my step father (who is from the Irish Republic) once she had settled. I grew up in a very difficult environment, and I can’t recall ever being happy at home. My relationship with my mother was (and still is) very strained, and I could never ever really communicate with her or relate to either of my parents. Home was a place where my talents were never encouraged and where I didn’t have a space to call my own. I shared a two-bedroom council flat with 6 relatives, and a single bed with my sister. My focus was always on escapism, so I used to read anything I could get my hands on; the back of soup tins, toilet paper, even Mills and Boom novels. I’m convinced that the latter is the reason I can read so well! By the time I was 16 I had, in effect, been abandoned – socially and economically – and left to my own devices. I was estranged from my parents and our relationship was so toxic by this time, that when they moved to a new house in Luton, I stayed on at our old council flat in Willesden by myself. What effect did your up-bringing have on you personally, as well as on your performance at school? Although I was bright academically, the lack of support from my parents resulted in me having very low self-esteem. I simply didn’t believe in myself or think that I could achieve anything much in my life. In effect, I just wrote myself out of the picture. So at school, even though I was clever, I didn’t have much focus or aspiration. At that time school was simply a means to escape from my unhappy home circumstances. I used it more as an outlet than as a place to study and learn. That started to change when the wonderful community of teachers and mentors started to support me. How did your mentoring relationship begin and then develop? It began when I was 12 and a teacher called Alex became my deputy head of year at Queen’s Park Community School in the London borough of Brent. During that year he recommended me to his (now ex) wife, Camilla, a TV producer, who was looking for a young person to take part in a BBC children’s exploration programme called ‘Serious Desert’. I applied and was chosen from 6,500 young people in the UK. When the programme ended I stayed in touch with Camilla, babysat for her 4 children and became friendly with her family. They kept an eye on me and encouraged me. They were almost like my second family. What did you gain and learn from having a mentor at this time? The relationship with Camilla and her family gave me a feeling of acceptance and a stability which encouraged me to achieve my goals. It also exposed me to a world that was so very different to mine and fuelled my desire for adventure. Just very simple things that were new to me, such as trying ‘middle class niceties’ like salmon and cream cheese for the first time, were a great cultural introduction to what was to come in Cambridge. So one of the unexpected benefits for me was gaining a form of ‘social capital’ that I wouldn’t have otherwise received. By ‘social capital’ I mean the sort of holistic education that includes exposure to things like political and cultural discussions; the type of conversations and experiences that expand a young person’s mind and horizons. It’s the kind of things, perhaps, that many families would discuss around their dinner tables, but which were lacking in my life as a child. How did you come to apply to Cambridge University? Even though I’d been identified as ‘Gifted and Talented’ at school, the lack of encouragement I received at home meant that I didn’t readily pursue academia, or maybe even see it as a realistic option going forward for me. 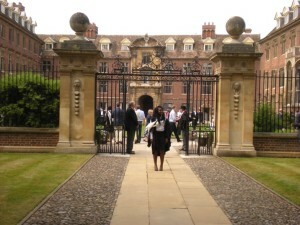 Nevertheless, several of my teachers (alongside Alex and Camilla) suggested that I apply for Oxbridge. I guess that they could see something in me that I couldn’t see in myself at that time. Anyway, I did apply, although I didn’t actually think I’d get in! Their belief in me helped me to challenge my own perception of myself. Had going to University always been a dream, or was it something which developed from having a mentor? Well, because I had been identified as ‘Gifted and Talented’ at school, I was taken on various day trips and visits to Universities with the hope that some day I’d apply. However, if these trips inspired anything in me at all, it was simply the idea that University was a way to escape from home. I wasn’t really concerned about which one I went to. How was your university experience, and did your relationship with your mentor continue through your time there and support you? University was very challenging. I was essentially so far behind that I felt not only like an outsider, but as though I was always playing catch up. As a result I lost whatever confidence I had mustered by being part of a community of dedicated, supportive people. But Camilla, Alex and their children visited every term, brought food for me and continued to support me as they had always done. They were the voice of encouragement and the ‘surrogate family’ that I so desperately needed. How did you do in your finals? Having begun at the bottom of my class – so much so that I came to college a week before everybody else to take part in an introductory learning session – I left top of my class. I worked very hard at Cambridge, but I was also blessed with people who believed in me and invested in me – my tutors, my friends and of course my mentors. When you graduated, did you know what career you wanted to pursue? No, not really. At one point I was looking at a career in Law. But then, during my finals, an opportunity to experience working in Politics came my way. I grabbed it with both hands and as a result I was offered internships and also paid posts working for David Milliband, Lord Mandelson and Baroness Young of Hornsey. Now I’m working at Citizens UK as a Community Organiser, and I absolutely love it. Does the legacy of your mentoring relationship still resonate in your life? Yes, very much so. I believe that without the input and encouragement that I had from my mentors, I wouldn’t have had the confidence to achieve all that I have so far. They encouraged me to pick myself up, and dust myself off, each time my self-esteem was knocked or thwarted or when I stopped believing in myself. Has your mentoring relationship also helped you build a happy home and family life? It definitely has. I recently became a mother, and I really feel that I’m now able to transfer that sense of security and stability that I received from Camilla and Alex to my own family setting. I want to give my daughter the encouragement and support that was lacking during my childhood. Why did you decide to start the Promise Foundation? Because I realised, from my own experience, how much mentoring can change a person’s life. I want to see young people have the sort of support and guidance that can help them to fulfil their potential and their goals. The stark contrast between my sister (who didn’t receive any form of mentoring) and me has become a clear indication that there is a real benefit in connecting young people from disadvantaged backgrounds with responsible, wise and committed adults. I’d like to see the Promise Foundation develop into an organisation that is a community effort. By that, I mean that it’s led and supported by parents, the community at large and local businesses and that these groups are committed to promoting the potential of young people by offering them help, support, advice, direction and also through broadening their horizons. Does the Promise Foundation have a USP? Yes, it does. And our USP is that Promise is a collective responsibility. It’s my challenge to this area of Queen’s Park (and any similar area, too): if you are going to gentrify, then ensure that you serve the community; that you don’t inadvertently displace those who are disadvantaged. For me, it’s very much about social mobility and equipping young people with the correct social and academic tools to take on their world. So I’m thrilled that our mentors have embraced this collective feat! Was it difficult to get the whole project off the ground? It was quite difficult, yes and I certainly can’t take all the credit. Many people, including Camilla, my sister Josephine, myself and others, we all worked incredibly hard to get it off the ground. We started off by harnessing the goodwill of the community and getting a working board together. And by utilising local relationships, particularly, that of Queen’s Park Community School and one of our benefactors, John Fairburn, we managed to raise the start up costs and attract many gifts in kind. In all we raised about £100k over the first two years. How is it going so far? What sort of results and feedback have you had? Since our launch in July 2013, we have mentored dozens of young people safely and successfully and inspired many more mentors to act collectively to better their community. In our pilot year 80% of the mentees made progress in more than three subjects during the program. Their attitudes towards their work also improved significantly with 87% of mentees showing progress in more than one area of work. And as well as this, our mentees also received many work experience opportunities with the help of their mentors. What is your vision for the Promise Foundation in the future? To see the foundation develop into a national charity that provides key solutions to social mobility and academic mobility. How do you think your life might have turned out or been different if you hadn’t been lucky enough to have had a mentor as you were growing up? What is the most important thing that your mentoring relationship has given you in your life? The ability to dream BIG! Not in halves and not in fractions, but holistically. And that’s what I want for other young people as well.